Any small space, whether it’s the bedroom, bathroom, or study, presents a few challenges – and even more so if it’s a room where you allow guests in on a regular basis, like the living room. You want to show off your exquisite taste in décor and furniture, and yet you also want enough space to enjoy some comfortable socialising with the friends. What a predicament. Don’t let your limited legroom put a damper on your love for entertaining. You can still make a stylish statement and have that room feel and look more spacious than it actually is. Don’t allow your small space to make you feel boxed in. Add some light and depth immediately by hanging a mirror. Bonus points if you can hang it across from a window, as the mirror will reflect the exterior view, as well as add some shine thanks to the incoming light. If that living room is very small, it may not always be possible to have as many seating options as you desire. So, when those guests’ numbers start to increase, simply swoop to the closet (or under the bed) where you keep your spare stash of folding chairs, poufs, or stacking stools. And after the friends are gone, put your secret chairs back in their hiding spot to avoid that cluttered look. 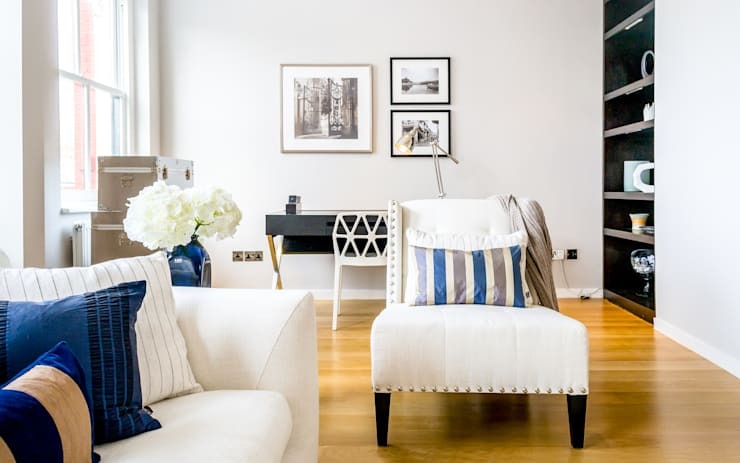 Be sure to check out homify’s extensive range of professionals who are ready and waiting to help you get the home you want; anything from architects and interior designers to electricians and painters. This might be a no-brainer, yet many people with small spaces still go for big and bulky – huge mistake. Mini coffee tables, small love seats, and slim chairs can help create both visual space and actual legroom. This will also make entertaining and socialising in the living room much easier. Cut the clutter by choosing furniture with built-in storage systems. Instead of a console table, add a small credenza to the side of the living room, with built-in drawers for those loose elements like remote controls, magazines, coasters, etc. And opt for a trunk or storage ottoman that can serve as your coffee table. 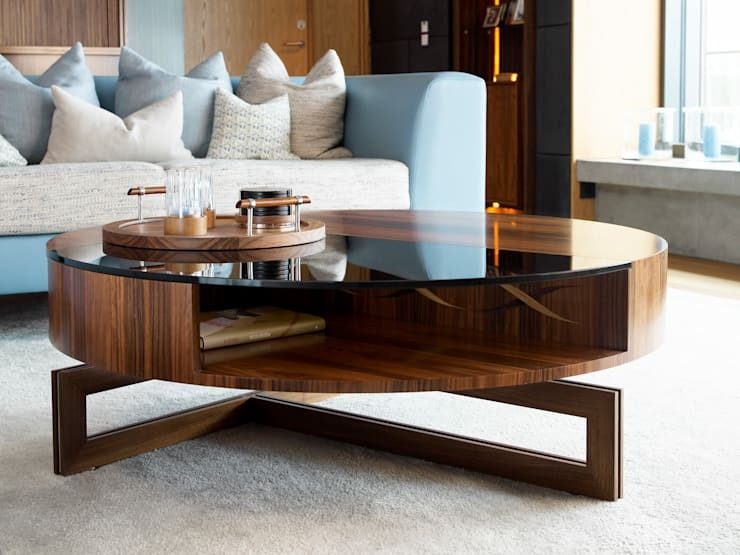 There’s more to living room furniture than just wood and fabric. Acrylic, Lucite, and glass can conjure up fabulous pieces that take up minimum visual space, resulting in a room that looks slightly more spacious than it truly is. Opt to have a table, chair, or bookcase in one of these 'invisible' materials. If your small living room has high ceilings, then you’re in luck. Although the extra vertical space won’t help with additional furniture, you can use it to draw your visitors’ eyes upwards, giving them the impression that the room is higher and grander. 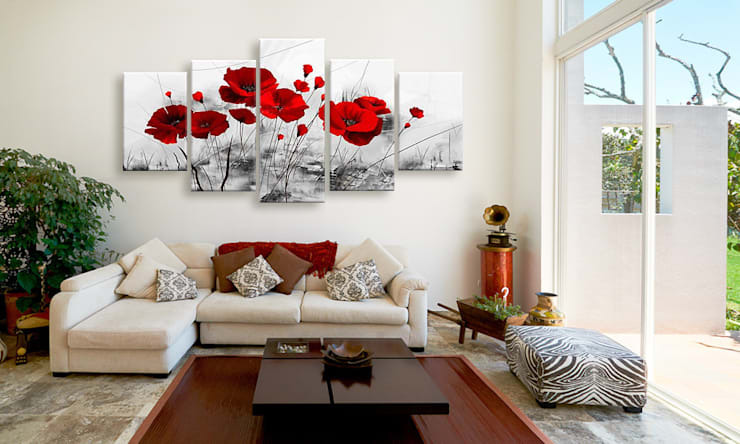 Make sure they see those high walls by hanging some stunning wall art like a professional gallery. When space is limited, your furniture needs to be beautiful and brainy. Opt for ottomans that can be turned into either table surfaces or seating options, or versatile stools that can function as chairs or tables. You don’t need a snug sofa to enjoy your living room. If space is limited, try circling a few armchairs around a coffee table, which will also make for a more intimate conversation zone. 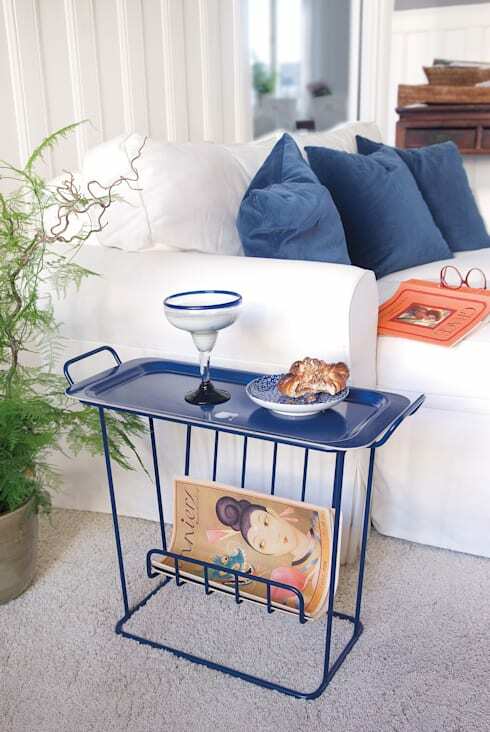 For additional flexibility, have a tray-topped ottoman as your coffee table, using it as an extra seat when need be. If you have the beauty of a fireplace in your living room, you really don’t want to obstruct that focal point. Put a pair of small, backless seats in front of it, which can actually draw more attention to the fireplace instead of blocking it. And if those ottomans or stools come with secret storage spaces, even better! Adding plants and flowers is another way to bring some depth to a small space, with a pleasing scent being the added bonus. Lush greens can soften corners and fool the eye into believing there is more space than there really is. Fresh green plants will always complement your interiors, regardless of your living room’s colour palette. Get some fresh inspiration with these: Plants For Living Room Spaces. Can you think of other ways to spruce up a small living room? If so, we’d love to hear them in our comments space, below!